I’ve been meaning to set this up for awhile but I never got around to it. I finally decided to automate my torrent downloading so I don’t have to stay up all night to get the night’s TV shows downloaded. To get this working you’ll need Automatic from coding curious (http://codingcurious.com/automatic/index.html), and of course a bittorent client. I use Transmission (http://www.transmissionbt.com/). Also, I use Automatic 1.0.5, which was free. I think now the latest free version is 1.1.4 (scroll down to the bottom right of the Automatic link above). Version 2 is not free and costs $20.00 with a 2-week free trial. This could be worth it for the TV Show subscription presets alone. But for now I’ve got 1.0.5, and this one will apparently run on Tiger (OS 10.4 all the way through Snow Leopard 10.6). I’m running Leopard 10.5.8 on my Mac. So anyway, once you download Automatic and install it, you’ll have access to it in your System Preferences down in the “Other” section. The initial screen is pretty simple. 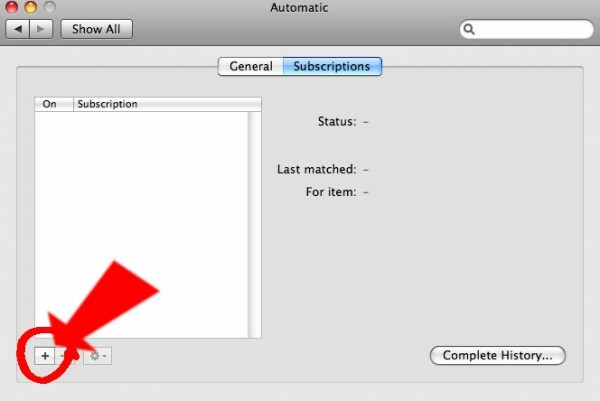 You’ll set the rate that Automatic will check your RSS feed for new entries and download the new torrent. You’ll also set the download folder for the .torrent file here. This isn’t necessarily where the actual program you download is going to go. You can change that later if you want. The only other screen in this version of Automatic is the ‘Subscriptions’ feed. Here’s where you enter in the details of the show you’re trying to get. I was a bit stumped at first but I finally figured it out. So you click the plus on the bottom to get started. You’ll see a screen asking for the description (name) of the show. Here you can also change the default download folder if you want. 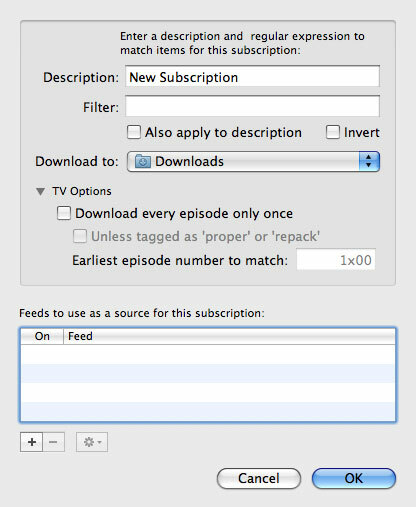 Underneath that you can set some options such as “Download every episode only once”. Sometimes depending on a show’s popularity you might get multiple releases of the same episode, or you might get an HD or Standard Def version of the same episode. If you check “Download every episode only once”, it will grab the first one it finds and the others will be ignored. However, sometimes that file may be bad, and it may be replaced by a ‘proper’ or ‘repack’ version. Checking “Unless tagged as ‘proper or ‘repack'” will tell Automatic to grab the fixed file for you. If you’ve already seen most of the season and you don’t need all the episodes, then you can enter in the earliest season and episode number you want to grab in the field on this screen. They have an example formatted for you. If I only wanted all the episodes after Season 3 episode 4 then I would put in 3×05, so Season 3 episode 5 will be the first torrent downloaded. One thing about this – I haven’t actually got this to work, though. It still went and downloaded damn near everything in the feed. There must be a syntax formatting issue on my end. What I’ve taken to doing is just getting it all out of the way. Letting it download everything, then deleting those torrents immediately. After that it only gets the ones that are new. I hate workarounds but it will suffice for now. 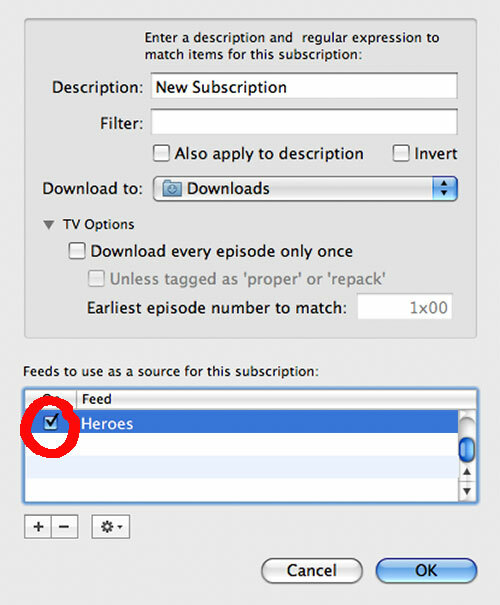 So they have the example of the (recently cancelled) show ‘Heroes’ helpfully provided here. I actually never had to download this show since I watched it pretty much every week. Anyway, if you click the search button you’ll get a list of all the torrent files EZTV has listed for that show. Once you get a search result, you should get the RSS link to plug into Automatic. 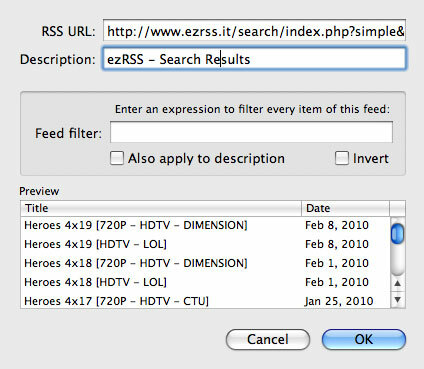 You’ll do this by right-clicking the RSS icon at the top of the search results, then choosing “Copy Link” from the context pop-up menu. Now you can go back to Automatic and paste that link into it. At the bottom of your current screen there’s yet more +/- buttons. Click the plus to add your feed. You’ll paste in the feed in top field. If the feed is accepted you’ll see all the entries in the bottom preview window. Even if you’ve limited the episodes you’ll still see most of them there. You’ll see those fields that are called “filter” or “feed filter” in here, too. These are looking for regex or “Regular Expression” syntax that’s used by a lot of programmers in search and replace actions. I use this sometimes but not enough to have a solid grasp of it for these purposes. I found a site here that teaches the basics of regular expressions (http://www.regular-expressions.info/). I’d like to find some sort of “Regular Expressions for Torrenters” cheat sheet somewhere, but I haven’t found it yet. I need to get a handle on this because sometimes I don’t want the hi-def version of a show, so I’d like to filter those out. After you add the feed, you’ve got to make sure that specific feed is checked in the above screen. You’ll end up with a whole bunch listed there so be careful you don’t have multiple feeds selected (unless you intend to do this). So essentially once you’re done with this, Automatic will scan the feed for your latest matching entry, then download the .torrent file and open it. It will open using whatever your default bittorrent client is. Make sure it’s set to use Transmission and we’ll continue on. Do this by doing a get info (command-I) on a .torrent file and setting the “Open with:” drop-down box to Transmission. Click the “Change All…” button beneath it and click the “Continue” button in the resulting dialogue box and that should make sure all .torrent files are opened with Transmission from now on. Now open up Transmission and there’s a couple of settings we’ll need to change in there to make it work optimally for this process. Go to the preferences, and in the first screen you’ll need to make sure “start transfers when added” is checked, otherwise it will just add it and it will be paused right away and never download. The second thing we need to do is uncheck the “Display ‘adding transfer’ options window” in that same screen. If you leave that on Transmission will always pop up that screen asking for your input before it adds the transfer. We need to have that off so the torrent can be added and start downloading right away. This should pretty much be the last step. The only snafus I’ve found in the system are operator error when I forget to leave my machine on. D’oh. This is all using the older version of Automatic. I haven’t tried 2.0 yet but hopefully it’s similar, except even easier. So good luck and happy torrenting.